Nowadays we live in a world of selfies. But Mother Nature, amazing as She always is, offers us a new kind of self-portrait…the image of our shadow surrounded by a rainbow, an optical illusion known as the Brocken Spectre, Brockengespenst in German or the Ghost of Brocken, named after the mountain it was first spotted on. So what is the Brocken Spectre and what’s the history of this optical illusion? Brocken Mountain is part of the Harz Mountains (highest peak is Bocksberg), located in Northern Germany, near Schierke, in Saxony-Anhalt, Wurnberg, between rivers Weser and Elbe. Brocken Spectre appears as a “halo-like ring of glory,” also called a “saint’s halo” or “god-shadows.” The spectre is an enlarged shadow of the observer surrounded by the rainbow. This hallo becomes visible on mountain regions, usually at sunset, definitely when the sun is low in the sky, and also when clouds, fog or rain are present. The Brocken Spectre images posted below were taken on top of Haleakala crater (10k ft or 3048 m above sea level) in Maui, Hawaii. 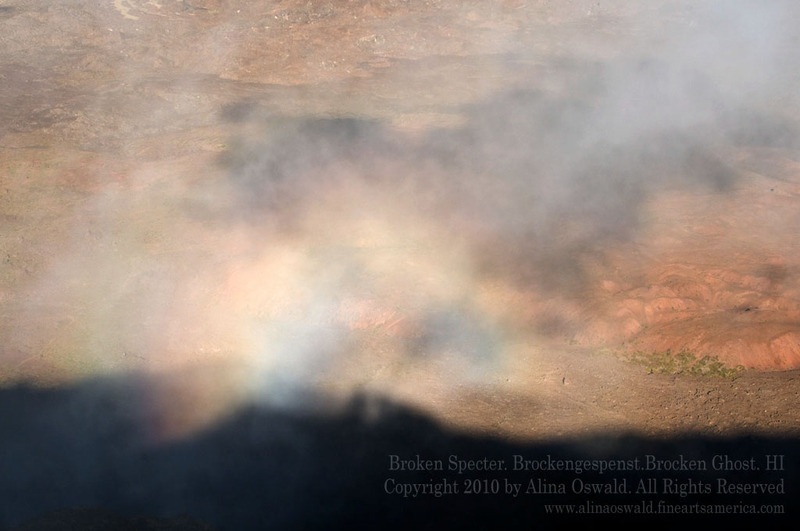 Close-up of Brocken Spectre. Haleakala, Maui. Photo Copyright 2010 by Alina Oswald. All Rights Reserved. Famous visitors on Brocken Mountain include Goethe, who mentioned the Spectre in Faust, and poet Heinrich Heine, who mentioned the spectre in Harzreise (1826). The words “Viele Steine, müde Beine, Aussicht keine, Heinrich Heine” describe the difficult mountain climb in foggy conditions. That brings me to my bucket list. I’ll have to add a visit to Brocken Mountain in Germany. There’s more to it than ghosts…. And while still on the subject of Heinrich Heine, recently I revisited his poem about a mermaid called Lorelei, when reviewing Brad Gooch’s new book, Smash Cut. The review was published in the July issue of A&U Magazine. Check it out!